Children in class at this UNICEF-supported kindergarten in Homs, Syria. Secretary-General Ban Ki-moon today joined a prominent roster of global leaders, campaigners and celebrities in Washington, D.C. to help launch a new worldwide campaign that aims to get 57 million children into school. The launch of the Emergency Coalition for Global Education Action comes in response to the news that the international community could fall short on the UN Millennium Development Goal (MDG) to get all children into education by 2015. If the current pace continues, it will be 2086 before all children are in school and learning. The coalition – which includes singer and songwriter Shakira, actors Jude Law and Goldie Hawn, and CNN International anchor Isha Sesay – will work even harder to accelerate progress until the end of 2015 to ensure all girls and boys are in school. “You are here to help ensure that every child enjoys his or her right to education – and I am pleased to stand with all of you in working towards that goal,” the Secretary-General said in his remarks on the launch of the new campaign. Mr. Ban noted that too many children are kept out of school because of displacement, conflict, child labour, child marriage, and sexual and gender-based violence. Moreover, entrenched poverty and lack of security often turn schools and neighbourhoods into places of vulnerability and brutality, instead of opportunity and vitality. The Emergency Coalition – convened by UN Special Envoy for Global Education, Gordon Brown – calls for four zeroes: zero child marriage; zero child labour; zero discrimination against girls; and zero exclusion from education. Mr. Brown called the current situation “unacceptable from a moral, economic and global security perspective” and stressed the domestic governments and non-governmental organizations must be pushed to honour their commitments to out-of-school children. The launch of the Emergency Coalition took place at the 2015 Countdown Summit held in the United States capital to pressure the international community to take action on behalf of children everywhere. The summit is organized in collaboration with ‘A World at School’ campaign and more than 100 civil society partners working to accelerate progress for children across the world. Sarah Brown, Founder of A World at School, will unveil a network of 500 youth ambassadors from 80 countries who are to work internationally to promote learning for all. The youth ambassadors form the UN Youth Advocacy Group for the Global Education First Initiative launched by Mr. Ban in September 2012 with the following three priorities: to put every child in school; to improve the quality of learning; and to foster global citizenship. 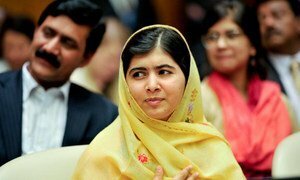 The ambassadors, including education campaigners Shazia Ramzan and Kainat Raiza who were caught up in the Pakistan gun attack on Malala Yousafzai, will be lobbying Governments for change, getting involved in local projects and trying to raise the profile of what is now a full-blown education emergency. They will also announce a June takeover of the African Union on the Day of the African Child to highlight need for urgent action for education. A Global Faiths Coalition for Education will also be announced at the summit, which will culminate with a shared plan of action for a 500-Day Countdown campaign to highlight important areas representing the key barriers to education. Among his other activities today, the Secretary-General attended a symposium organized by the World Bank on learning for all, at which he stressed that there is no greater return than investing in education. “I call on political leaders to show the leadership and foresight needed to reap the many benefits of a well-educated and highly-skilled population,” he said. “I also call for those investments to be targeted to countries most in need and the young people who are hardest to reach,” he added, noting that this includes children in fragile and conflict-affected States, girls, children with disabilities, children living in remote rural areas and those living in poverty. Mr. Ban also attended a World Bank event at which leaders called on young people to help make this generation the first in history to end extreme poverty. “I know that your generation can break this vicious cycle of extreme poverty, and I count on your strong engagement and leadership,” he told the event, which featured the inspiring voices and stories of young leaders taking on critical issues – from entrepreneurship to education to gender equality.